Are you new to the world of gardening? Or maybe you are just looking for a little extra help. No matter the reason, you can trust the Miracle-Gro® LiquaFeed® All Purpose Plant Food Advance™ Starter Kit can help you grow flowers, vegetables, trees, shrubs, and houseplants. The starter kit contains the garden feeder, a 16 fl. oz. 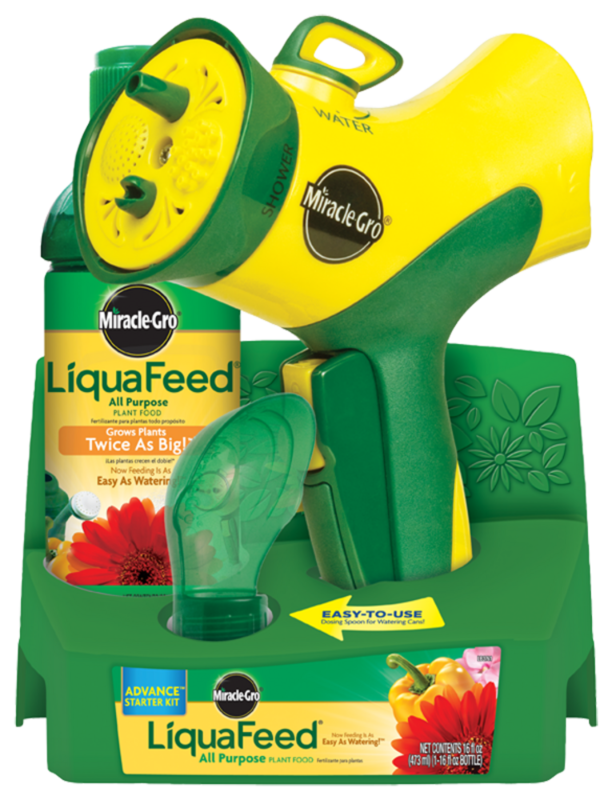 bottle of Miracle-Gro® LiquaFeed® All Purpose Plant Food, and one dosing spoon. The easy-to-use dosing spoon lets you feed plants with a watering can. Apply to soil at base of plants. 1) Attach LiquaFeed® feeder to garden hose. 2) Insert Liquafeed refill bottle by removing cap and twisting into Liquafeed® feeder. 3) Feed by spraying the soil at the base of the plant until soil is saturated. 1) Attach dosing spoon to bottle by removing cap and twisting dosing spoon onto bottle. 2) Tilt bottle and gently squeeze so that liquid begins to fill dosing spoon. Fill to top line to mix with 2 gallons of water, fill to lower line to mix with 1 gallon of water. 3) Pour Miracle-Gro® LiquaFeed® All Purpose Plant Food from dosing spoon into watering can and fill with water. Apply diluted solution to the base of the plants. One gallon feeds approx. 10 sq. ft.
Use to feed all types of in-ground or container flowers, vegetables, trees, shrubs and houseplants. For best results, use every 7-14 days. Connects directly to a garden hose and includes an easy to-use dial to switch between feeding and watering. Specially formulated to feed all types of in-ground or container flowers, vegetables, trees, shrubs and houseplants. Automatically applies plant food while you water at the corrected rate, no mixing, no measuring, no mess. Imagine Growing Bigger, More Beautiful Plants! Feed with Miracle-Gro® LiquaFeed® Plant Food every 7-14 days and be the envy of your neighborhood! Helps develop strong roots and grow high-quality fruits and vegetables. Miracle-Gro® LiquaFeed® Bloom Booster Flower Food promotes more blooms for greater color compared to unfed plants. Feeding is as easy as watering. Makes feeding as easy as watering! Grows plants twice as big!